Liquipak® fiber (fibre) drums are available with several lining and barrier combinations. This makes it ideal for hard to hold liquids and solvents. The inside ply of every Liquipak® drum uses a plastic lining system that is bonded to the drum sidewall and bottom as an integrated laminate. These drums were developed to hold liquid and semi-liquid products. The interior of the drum features a full laminated plastic interior surface using heat-sealed seam, caulked bottom juncture with either a plastic or steel cover. 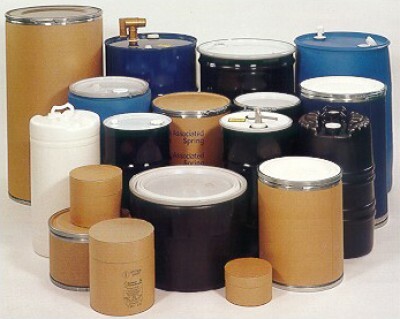 The 30 gallon and 55 gallon Liquipak® drums, which have been requested the most, were made with plastic covers with a 2 inch and a 3/4 inch plug and a 5 mil PE lining. Looking For Carbon Steel Drums?